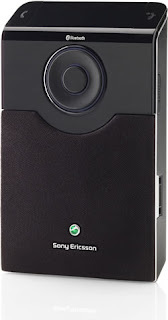 Brian C Mounts: Sony Ericsson HCB 150 - I Want One! Sony Ericsson HCB 150 - I Want One! I understand that California is going through some law changes this summer. Everybody driving a car as of July 2008 needs to be using a hands free device if they are using a cell phone. I knew this a while back so I picked up a Parrot Drivers Headset so that I could start the hands free experience while driving a little early. I didn't realize this at the time but after it arrived I found out that my ears are strangely shaped and these in-the-ear buds don't stay in my ear; they just fall out. Flor however had better luck with it and liked it nicely, it has a nice car charging dock for it so it's always charged and always has a placed to be stored while not driving so I gave it to her. Since then however I've been in the market for a new device. I don't really care for the standard over the ear models that are meant to be portable. I'm really only in this for a car kit. I don't want to have to worry about charging it and I don't want to have to worry about messing around with attaching it to my body... which led me to this awesome discovery of the Sony Ericsson HCB 150, which won't be released until the 2nd quarter of this year. I can't wait; I've fallen in love. This do-dad is looking awesome. 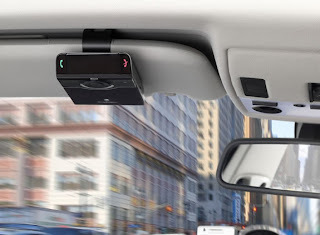 "Sony Ericsson has announced the new Bluetooth hands free Car Speakers HCB-150. The SE HCB-150 features a convenient text 2 speech feature & verbally alerts you who is calling. The Sony Ericsson HCB-150 has a talk time of up to 25 hours Yes 25 Hours & 700 hours standby time. 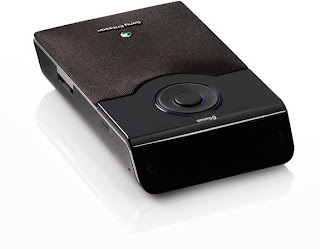 The Bluetooth Car Speakerphone Sony Ericsson HCB-150 will be available globally from Q2 2008."